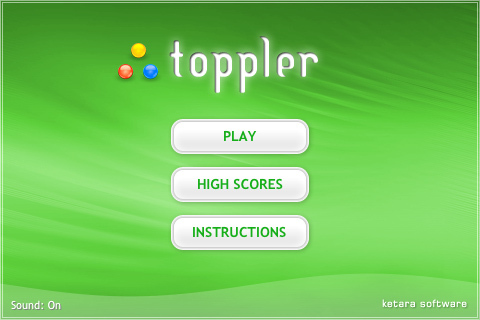 Toppler is a game for Apple's iPod and iPhone devices in which you control a little green frog, jumping from one shrinking lily to the next, and guide him to reach the end of each level. Simply tap the screen in the direction you want him to go to. Along the way, you can collect and lose points, gain bonus lives, and, at higher levels, evade enemies looking to get the best of you. And don't forget - while playing the game, watch for any unexpected objects that may appear, as well. Screenshots below illustrate the game's general look and feel, as well as some of its features and gameplay scenarios. Q: What is the goal of the game? 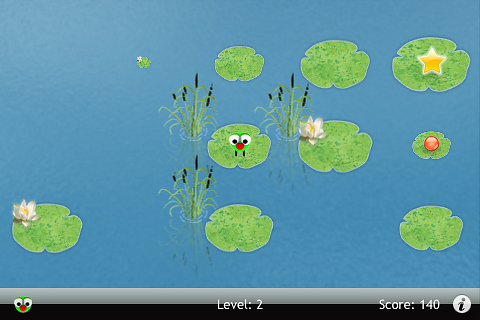 A: The goal of the game is to guide a little green from form the lily in bottom-left corner to the lily with the star in the top-right corner, while avoiding shriniking lilies, negative point deductions, and enemies looking to harm you. If the lily the frog is on becomes too small and disappears, the frog drowns. A: Simply tap the screen in the direction you want the frog to go to. You don't have to tap the exact lily you want to jump to, just give a general direciton - up, down, right or left. No diagoal moves are allowed. Q: What are the colored spheres that appear on the lilies? A: The red and the yellow spheres give you an extra 25 and 50 points, respectively. 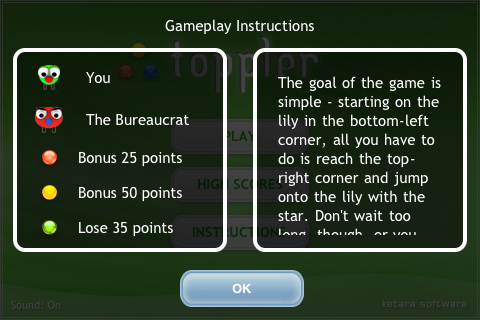 If you jump on lily with a green sphere, however, you lose 35 points. For all other inquiries, please contact us at .